FJ Torres insurance roots go way back in Dighton, since Frank Torres' involvement in town government. 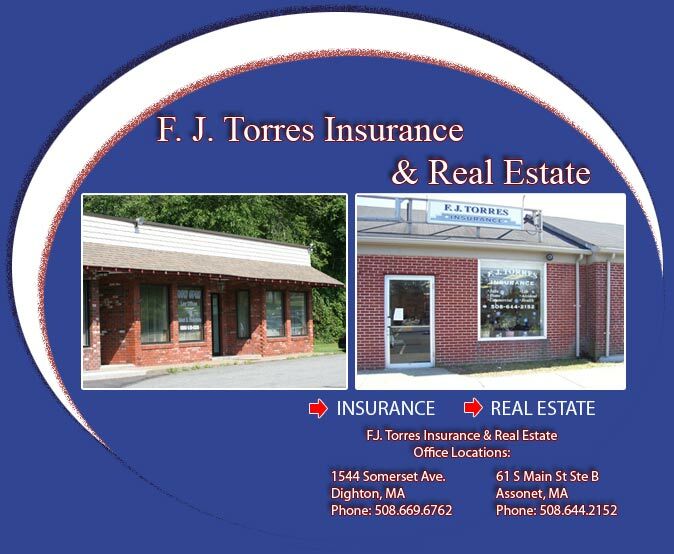 FJ Torres Insurance has been a prominent business in Dighton and Assonet Massachusetts and the surrounding area for over 40 years. The agency got its start when Frank and his daughter Deb Fredericks started the business together in January 1974 and it has since been known as the FJ Torres Real Estate and Insurance Agency. Later, Deb's son Robert Fredericks joined the agency. Deb manages the insurance agency and Robert, a lawyer, is involved in the business as well as running his law practice. As a multi-generational business, Deb Frederick's daughter, Julie Preston, manages a large part of the customer base. Julie is constantly shopping for the best policy and the best price for their clients. A second office was opened in Assonet in 1995 as a way to better serve customers who live in or near Rhode Island. The agency's goal - To always treat the customer with the utmost of respect, provide insurance products at a reasonable price and to over deliver on customer service. The agency employs six top notch insurance specialists who are knowledgeable in all lines of property & casualty insurance, business insurance as well as life insurance and financial services. Visit the "Meet the Team" page to learn more about our insurance specialists.